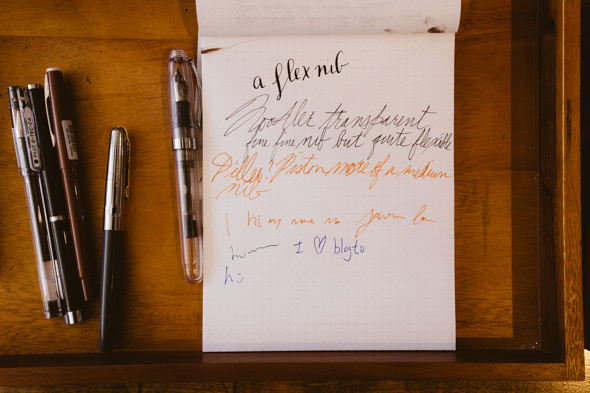 Wonder Pens has found a way to bring back the written word. 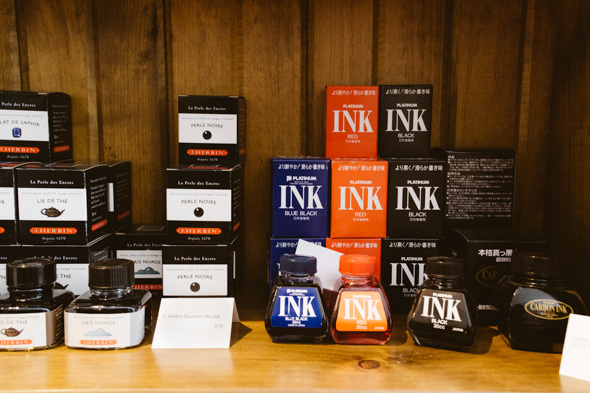 The little shop sells a huge assortment of fountain pens, ink, and stylin' little notebooks. 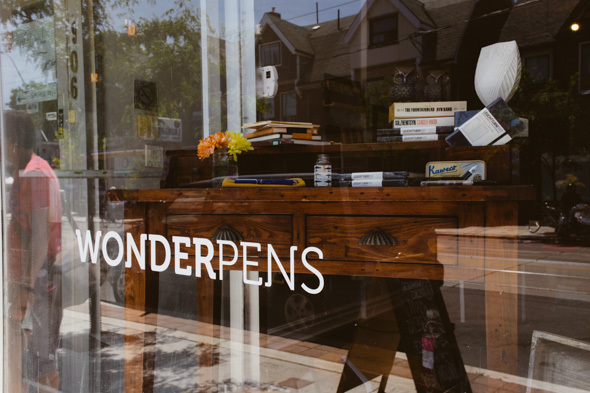 Owner Liz Chan used to teach middle school students in Regent Park before she opened Wonder Pens with her husband, Jon. "You know what they say about school teachers," she says, half-joking. "We love school supplies." As I sit down at the counter to chat with her, Louis Armstrong croons in the background, and Chan shows me what the deal with these special pens. I'm curious to know who is actually in the market for fancy pens in the age of the text message. As it turns out, I'd been thinking with blinders on. Chan reminds me that lots of artists and editors live in the neighbourhood, and they've been popping in to get supplies. The shop carries dotted paper and graph paper as well as lined and plain, which makes it a great option for architects and engineers, too. There are also little reporters' notebooks like the Webnotebook by Rhodia, which is similar to a Moleskine, only with thicker paper. Alongside neighbourhood folk, Chan says some people from the suburbs have made the trek downtown just to visit her specialty shop . And specialty it is. Chan says she noticed a gap when it came to spots to pick up a good pen, and she would order supplies from eBay or stores in the states. A store, she decided, had to be born. Pads and pens are set up around the store so customers can test out the pens (or just doodle), and I get the chance to do that as we chat. I'm no pen aficionado, but I can tell she's got some especially worthy ones in here. My favourite is a pen by Kaweco , and it's a German design ($23). Another really nice option is one by Twsbi , and that's from Taiwan ($50). Most of the designs they sell are from Germany or different Asian countries, Chan says, because fountain pens are still widely used in those areas, and they're better for drawing characters, too. If you're looking for a less-expensive option, there are lots of those available too, both in store and on their site . Alongside pens and many colours of ink (I spot yellow, green, purple, red, and other colours as well as blue and black), there are the aforementioned many-styled notebooks, little leather pen cases, crazy cool retro staplers and a rainbow of gel pens and unique pencils. School supply nerds, artists and geeks of other ilks: you need to stop in here. 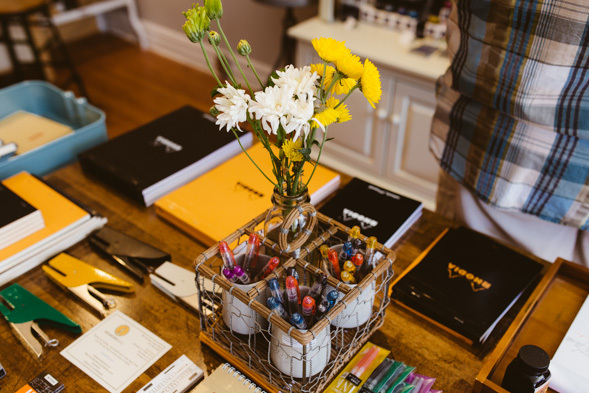 Wonder Pens is a little haven just for you.